It’s September. The nights are drawing in, we are seeing less and less of the sunshine, the clocks will soon be going back. It is time to start thinking about packing away the BBQ and the garden furniture in favour of log fires and winter woollies – this presents us with a challenge to our health and vitality. During the summer months it is easy to spend a lot of time outside – it’s warm, the sun shines, it doesn’t (if you’re lucky) rain too much and the evenings are longer. And often, we feel better for it. We feel happier, healthier, more energetic. But, as winter approaches, we spend more time inside and our mood may be a little less bright, we may have less energy and we get more coughs and colds. Why is that? The answer lies in the weather – we need the sun. It is important to our health because, when we get a good daily dose of sunshine our body converts the UVB (ultraviolet B) rays from the sun into vitamin D which plays a vital role in the healthy function of the body. The most well-known function of vitamin D is calcium absorption which ensures the growth of strong, healthy bones. Strong bones are important for maintaining the body’s structure, protecting our organs (especially the spinal cord that runs down inside the spine), and providing a firm anchor for the muscles. As we age, we naturally start to lose our bone strength (or bone density) and this can lead to osteoporosis – a huge cause of A&E admissions for the over 65s – so it really is essential that we do our best to maintain our vitamin D levels throughout our lives. In fact, it’s not just our bones that rely on vitamin D, most cells and organs in the body have some form of interaction with vitamin D. And, as you know from conversations with us, it’s really important to have healthy cells and organs. 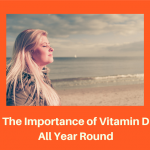 Vitamin D is so crucial to our health that it has been the subject of plenty of research in recent years which means we are building a far greater understanding of the importance of getting enough of it. For example, research from 2013 found that a reduction in vitamin D in the body has the potential to increase our risk of developing many chronic diseases including autoimmune diseases, some cancers, cardiovascular disease, infectious disease, and diabetes1. So, getting enough vitamin D is easy during the summer months – we’re outside more, the sun shines more so our body has ample opportunity to soak up those UVB rays and convert them into more than enough vitamin D. However, because it is water-soluble, the body is not very good at storing the vitamin D it produces which means that no matter how much time you spend in the sunshine during the summer, you can’t store up enough to see you through the darker winter months. So, most people need a daily boost of vitamin D through the winter – the recommended daily dose is currently 10 micrograms (mcg). However, there is some evidence to suggest we need slightly more than that so we recommend taking a daily vitamin D supplement of 25 mcg from October through to April. This will encourage good bone health and general body function throughout the year. Regular chiropractic care will also help support your body’s immune system, strength, and nervous system. At Shrewsbury Family Chiropractic, we are all about keeping you and your family as healthy as possible all year round, so you can be the best version of yourself. To find out more, speak to your chiropractor at your next adjustment.